Should I Have Surgical or Non Surgical Brow Lift? Home/Blog / Surgical Vs. Non-Surgical Brow Lift: Which Is Right for Me? A heavy brow line or wrinkled forehead can make you appear older than you feel, and these common signs of aging can also make you look upset, tired, and unapproachable. Fortunately, our experienced facial plastic surgeon Ali Sepehr, MD performs surgical and non-surgical brow lift, both of which are designed to rejuvenate the upper face for a more youthful appearance. What’s the difference between these two popular procedures, and why would you choose one over the other? We break down the benefits of each method to help you determine which option can best achieve your cosmetic goals. Brow lift and forehead lift are two terms for the same surgical procedure, which is intended to reposition the tissue of the upper face to a higher, more youthful location and reduce excess skin. In most cases, Dr. Sepehr will perform an endoscopic brow lift, which utilizes a few small incisions to minimize scarring and provide the best possible result. A surgical brow lift can treat sagging skin, crow’s feet, horizontal forehead wrinkles, and vertical wrinkles between the eyebrows. This technique may also benefit you if you’re experiencing mild drooping of the eyelids. A surgical forehead lift will require a more significant recovery period than non-surgical treatment, and you should consider the extent of your anatomic concerns as well as your available time off before selecting this technique. Dr. Sepehr will discuss your full range of options and their benefits, limitations, and risks during your initial consultation. If you don’t have two weeks to devote to healing and your symptoms aren’t advanced enough to warrant a surgical procedure, a non-surgical brow lift or Liquid Facelift may be right for you. Utilizing the most advanced dermal fillers and cosmetic injectables available, Dr. Sepehr can smooth mild to moderate wrinkles, improve skin texture, and enhance volume along the brow line with little to no downtime. One consideration, however, is skin laxity. 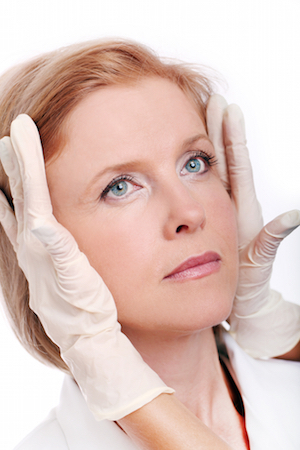 If your brow has become heavy, BOTOX® Cosmetic and similar treatments may exacerbate the issue. A surgical brow lift can remove excess skin that contributes to a heavy brow, but a non-surgical procedure cannot. Furthermore, minimally invasive methods are temporary and typically last between four and six months before requiring a touch-up session. You should discuss your expectations for results with Dr. Sepehr during your initial consultation, and he will recommend the best course of action to achieve your desired outcome. If you have additional questions about surgical and non-surgical brow lift, or if you would like to schedule a consultation with Dr. Sepehr, please contact us today.